After two years of operation (Feb. 2005) with nearly 50,000 activations, it became important to check the ballistics of the shutter built by CEA, clearly the piece of equipment in MegaCam which gets the most mechanical stress during its operation. 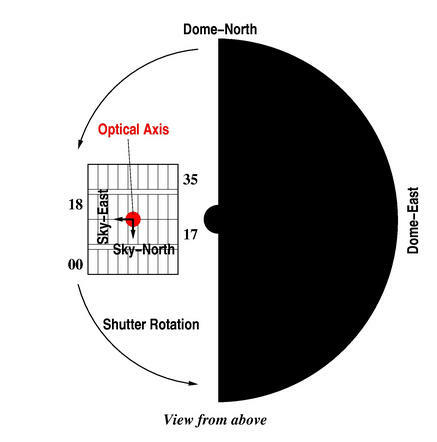 CEA delivered the shutter with the following specifications: an accuracy of 0.003 second, and an uniformity of the exposure level over the mosaic of 99% for a 1 sec exposure. The following study based on data gathered during the 05AQ01 run (Feb. 2005) confirms these numbers are still valid. Figure 1. Shutter and mosaic geometric configuration. Figure 2. Illumination pattern across the CCD mosaic. Figure 3. Non uniform illumination (<0.3%) [mosaic as shown on Fig. 1]. 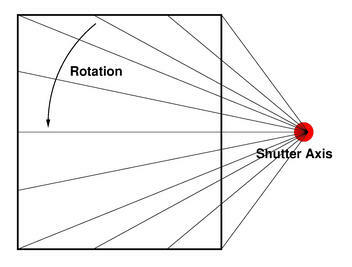 For the 1 versus 3 seconds frames (the 3 second exposure time is considered as the threshold where the exposure is 100% uniform), that difference amounts to 1%, right within the specifications of the builder. The bottom corner CCD (CCD07) is getting more exposed than the top right corner (CCD35) for the 1 second exposure at a level of 1%, but the vast majority of the mosaic is more uniformly illuminated, specially the center where most photometric standards are observed. There are sensors positioned in the shutter structure measuring exactly the time the shutter was open for: this is loaded in the EXPTIME keyword of all exposures (REQTIME only reflects what was requested by the acquisition system, the actual exposure time always turns out to be a bit longer, hence REQTIME should NEVER be used for any serious photometry work on MegaPrime data). The precision of the level of exposure and the reported timing of the exposure is extremely precise: to within 0.3%, again still right on the delivered specifications by the builder. When comparing the scaling of flux versus the scaling of different exposure times (here comparing the exposure times that differ by a factor of 2), one can see that indeed shorter exposures are a bit longer than they should (but then again EXPTIME keeps nicely track of that), and the ratio between the flux ratio and the exposure time ratio is within 1 percent, but there are most likely systematics caused by the photometry extraction due to comparing objects which flux has doubled between the two exposures. The error is most likely not due to a shutter timing as the previous table shows a perfect timing at the 0.3% level.